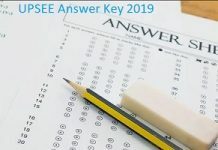 UPSEE Exam Pattern 2019: This article provides the latest exam pattern of UPSEE 2019. The Mode and duration of UPTU entrance examination of 2019 have been listed in this article. Check out the UPSEE syllabus of Physics, chemistry, and maths for the academic session of 2019-20. Tips on How to prepare for UPSEE 2019 has also been given here. Check the UPSEE 2019 marking scheme in this article. The exam Pattern of UPSEE(Uttar Pradesh State Entrance Examination) includes all the details regarding the exam information like the mode and duration of UPSEE 2019 and the exam pattern like number of questions, number of sections, the language, marking scheme, etc. To prepare efficiently for the examination, candidates must make sure that they know the UPSEE 2019 exam pattern first. Check out the UPSEE 2019 Exam Pattern for the various papers here. MODE OF PAPER – Paper 1,2,3,4 will be conducted in offline in OMR sheets. MODE OF PAPER – Paper 5,6,7,8,9,10,11 will be computer-based test (online). Paper 1, 2 and 3 will be conducted for B. Tech/ B.Tech (agriculture engineering), B.Tech (Bio-Technology), and B. Tech (agriculture engineering only) respectively. LANGUAGE – The Language of the question paper will be English and Hindi. TYPE OF QUESTIONS – Questions will be of objective type Multiple type questions. DURATION – The exam will be held for a duration of 3 hours. TOTAL QUESTIONS – UPSEE 2019 question paper will contain total 150 questions and will be marked out of 600. MARKING SCHEME – 4 marks will be allotted for each correct answer. There is no provision for negative marking. To know the exam pattern of all the 11 papers, have a look at the table below. Paper 1 Physics, chemistry, mathematics 600 50 objective type question from each subject. Total 150questions. Paper 2 Physics, chemistry, biology 600 50 objective type questions from each subject. Total 150questions. Paper 3 AG-1, AG-2, AG-3 600 50 objective type questions from each AG. Total of 150questions. Part B: Drawing Aptitude 500 50 objective type questions each of Mathematics and Aesthetic Sensitivity with a total of 100questions and 2questions to test drawing aptitude. Candidates must know the correct syllabus of UPSEE 2019 in order to prepare well for the exam. The syllabus of the exam will cover topics studied in class 11th and 12th. For B. Tech course, the UPSEE 2019 syllabus has been tabulated below under the headings of Physics, Chemistry and Mathematics. Appearing candidates must make sure that they prepare efficiently for the examination. Apart from the exam pattern and syllabus, candidates can follow the tips given below to prepare for the UPSEE 2019. Candidates must start off by making a timetable for each day. This will help the candidate to manage time. Know the full syllabus to gather the correct study material. Candidate must tudy from NCERT books and practice as many sample papers as you can. Take mock tests if available. After completing the syllabus, revise each and every topic from all the subjects. Learn each concept and understand it without mugging up a for the exam. Eat healthily and have and good sleeping pattern during days of preparation.